Usually, when a person makes something, say a knitter making, I don't know, a sock, that person knows whether the final product is a winner or not. There isn't usually a grey area, it either came out great or it didn't. But sometimes, you can knit pick things a little. 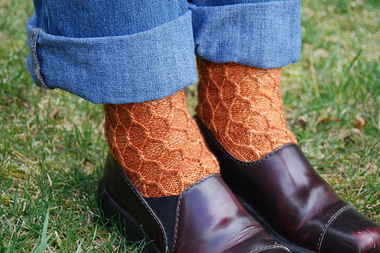 Like, "oh, well these socks look great, but the fit's a little off," or some such assessment. These socks, I am pretty sure do not look great. I don't think they are hideous, but they are, by no means, spectacularly aweseome, which really is my goal (most of the time). While I do not usually aim for mediocrity, sometimes, due ot my own laziness, I am forced to accept it. But back to these socks. I want to love them, but I only like them, and I only like them because I knit them while K and I traveled the Mediterranean for our tenth anniversary a few short months ago. Also, they fit really well, and they are warm. So, sentimentally and practically speaking, a winner! Visual aesthetics-wise, not so much, at least not for me. Some people actually like pooling, that magical phenomenon that occurs when variegated yarn doesn't hit its happy medium of gauge and whatever else is required to make varigated yarn not look like crap. I have no idea if this yarn is supposed to stripe or not, to be honest, but I am not enamored of whatever it's doing in this sock. And I don't think it's just me. 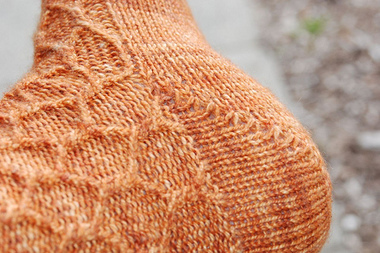 I have used Shibui sock yarn before, and pooling can sometimes be an issue, but sometimes, it's not an issue at all. At the end of the day, it hardly matters, really. I have a completed pair of socks that will keep my feet warm and two less skeins of sock yarn sitting in the stash, so that's something. I am feeling like a sock making machine right now. Really, I am. 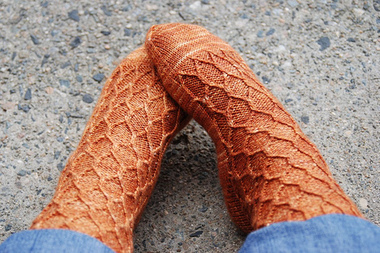 I finished these socks last month; and, they are awesome. Their awesomeness makes me question my reasoning for leaving them unfinished for so long; but, that's usually the case with these sorts of things, no? So a little over two years ago (actually, it was almost three, but saying "a little over two" sounds less pathetic) I participated in a single sock swap. 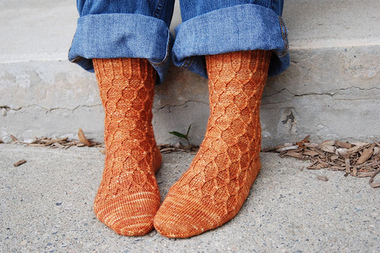 The premise being that if you only have to knit one sock, you wouldn't get tired of the pattern, there would be no "second sock syndrome" etcetera, etcetera. I knit my single sock for my partner, and she, in turn, produced a mate to her sock. Rangsiwan knit one uptown boot sock for me. I was very excited about it. I liked the pattern, I liked the color, loved the yarn...but (and I am not sure who is to blame here, probably me...) the pattern somehow got separated from the sock. And so did the notes on modifications. I have the Favorite Sock Patterns book that houses a copy of the sock pattern, but it was immediately clear that Rangsiwan made modifications: to the cuff, the heel and even, yes, the toe. I think it's fair to say that I was not as indutrious then as I am today--I was also pretty lazy (which, that trait hasn't changed much, really); but, I wanted to finish the sock, because it was one of two sock(s) that took away my sock knitting mojo. Well I figured out what needed to be done because when you have been knitting for long enough, you sort of understand what's going on, I guess. I figured out Rangsiwan's modifications and knit the sock (in fairly short order, too). The end result? A smashing pair of red Uptown Boot Socks knit in some really great (Sundara) sock yarn--color 012, but you can call it "red" if you want. Any plans for Easter weekend? I will be working on my basement which got flooded (repeatedly) in the last two weeks (you know those rainstorms in the northeast? sigh. ); chasing down some "bunnies", and finishing up a quilt (which is going to be fabulous!). I might even do some knitting. Have a great weekend! There's really not a whole lot to see here; but, I was finding my blog silence a little sad, so I thought I'd drop in. I am in the midst of various and sundry projects in progress and have nothing in the way of finished articles of brilliance to share. And since there was a time when people who read knitting and craft blogs liked to read about what other knitters (and crafters) were working or how knits were holding up, I thought, "I could do that." A long time ago, when he was wee, I knit Little Sir a hat to warm his noggin. This picture is 2.5 years old!! It was a little big; but, it did its job. When we got the first big chill in Connecticut earlier this week, we were scrambling around to find things to stay warm and we found his old hat again. My first thought was to use it on Little Mister's head; but, Sir was having none of it. It was his and he was going to wear it. Surprisingly, it fits. Actually, it fits much better now and he is super excited about it. He is convinced that his yellow mittens work with the hat as a natty ensemble. I don't like to argue with him, so I just agreed. Of course, this means that Little mister is a bit on the hatless side right now. This makes him sad. I need to do something about his hat situation; but, it would mean covering up his curls, which I am loathe to do. Aside from digging through winter wear to find knits that don't exist (since it takes me forever to finish anything these days), I have been slogging away on my Babette Blanket which got stalled due to yarn shortages. I grossly underestimated the amount of yarn a crocheted blanket would require. I think I read somewhere that a crocheted blanket takes 30% more yarn than one that is knit. I can see why some many crocheters love acrylic, because seriously, I have had to put in two more orders for wool and you know, the natural fibers, they are not inexpensive. I am a little obsessed with crochet right now. Aside from the amount of yarn required, it's so efficient. If you are measuring efficiency by time and not resources, I suppose. The economy of movement required is pretty thrilling too. I am still knitting too, of course. I started a pair of socks for charity. It's a plain old stockinette sock. I am not in love with the way it's turning out, which is probably for the best. If I liked it too much there would be danger in not wanting to offer it up for charitable purposes. And then I am still knitting the vest I have spent an inordinate amount of time working on. You'd think I was knitting a man's sweater for Pete's sake. Thank goodness for two-hour line waits for flu shots, I guess. So that's what I am about right now, what about you? What'cha doin'? Now that January is half done, it only seems sensible to talk about the knits that I finished last month in December, you know in 2008. I finished two knits that I am really happy with. The first knit was another Baby Surprise Jacket. I wasn't too impressed with the first one that I knit, but the second one is great. I think I just needed to put my kid in a bigger BSJ, as he is a big kid. The sleeves were the right length--they were not too short-- and the yarn was pure joy to knit and the end result is a really cute sweater for a pretty cute boy (there is obvious bias here, of course). The other knit was a pair of socks. For whatever reason, I don't do so great with the sock knitting, I get bored with it for some reason (second sock syndrome, anyone?). But I managed to get a pair of Nutkins knit for myself. The yarn was a birthday gift last year from a knitblogging birthday twin (thank you Rangsiwan!). 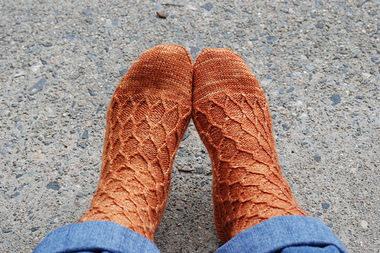 I really like the way the socks turned out, the pattern was well written and you can't go wrong with Koigu. I did a knit/purl cuff instead of the cuff prescribed and I mirrored the pattern for the second sock, an idea I totally stole from Maritza. I am really happy with the socks, mostly because of the modification I made to the heels--eye of partridge heels, what is not to love? So that is it for the 2008 crafting. I am not going to do a summary of the year, if you want to see the past knits (and other projects), feel free to look in the gallery of 2008 projects ortake a look over in flickr. I haven't the energy to be redundant today. I do however have the energy to start plotting some 2009 crafts, I am pretty excited, because, as you all know, I have copious amounts of free time now. Heh. With some of that copious free time, I will update the gallery and include the specs for these last two projects (socks and bsj), I will also post the info in Ravelry, of course. And there is still time to toss your name in the hat for the "it's not a resolution" contest, just leave a comment onthis post (the post below). Well, as long as they are babies or toddlers. I am still nervous about the whole dealing with the boy teenager thing; but, we'll cross that bridge when we come to it. It just occurred to me that I never shared the gender of baby Disco. From the title and the pictures, I am sure you have figured it out. Baby Disco is a boy. Elinor is advocating for the name "Little Mister," which I find all kinds of scary because I was considering this for the blog name "if the baby was a boy." Little Sir is VERY excited about this, a brother means he will have someone to "play trains" with. Considering that he was introduced to the great world of trains and train-obsession by his friend Caroline, his logic doesn't make any sense, but he is two. He is excited about having someone to "roll balls" with as well. After about 10 minutes, the parental units are no fun with the ball rolling. I have to be honest, I was looking forward to the possibility of making dresses and knitting a pink wardrobe for a little mini-me (I even bought a crapload of pink yarn, because I "had a feeling"). But after finding out that Disco has boy parts, I calmed down and remembered that: 1) I don't like the color pink, it makes me want to vomit, 2) I would have no idea what to do with a girl, really (despite the fact that I am one...), 3) Little Sir was hoping for a baby brother (after he accepted that a baby was going to be part of the picture whether he wanted one or not); and, 4) logistically, we are already prepared for a boy (you know, having one in the form of Little Sir, already)--or rather, I know what boys like. and automobiles (these little cars are Little Sir's new thing--it's kind of driving-heh- me crazy). They are just a pair of booties. But if you want the good word on them, I will put the info in the gallery and ravelry for your perusal. It's a shame that I didn't finish these socks sooner. They are fabulous (if I do say so myself)! I figured with the big goodbye to Magknits, it was time to put the Snickets to bed. The fact that I started them last July was also a factor. I knit the first one fairly quickly (for me). But the second one lagged. I have noticed that I procrastinate finishing projects when there is something about them that I dread. Oh, have you noticed that too? In any case, with these socks, I was not particularly excited about the short row heel. This is my first (and probably last, if I can help it) short row heel. Like Opal, I am a heel flap kind of girl. But I figured that I would at least give it a try so I could say I did a short row heel and give myself ample justification for complaining about it. That being said, these are still my newest favorite socks. The pattern is great (hopefully the designer will offer it through Ravelry or elsewhere); but, the yarn....well, it's out of this world, people. They are nice and cozy...just in time for summer. These socks will probably see the most action after summer (the season that hasn't quite arrived in my corner of the woods yet) wraps up. So when fall rolls around again, I well be suitably prepared. I will post details on the Rav (Ravelraiser, are you in the know?) and in the gallery for those who are not yet Ravel-ing.